Every year when it’s time to set up our classroom for the students, we look at areas that worked well and areas that need some improvement. One of the routines that works well for us (and just needed a little facelift) is our Snack Time routine. The primary goal is independence! We work on teaching the children to do things for themselves, as they are able. 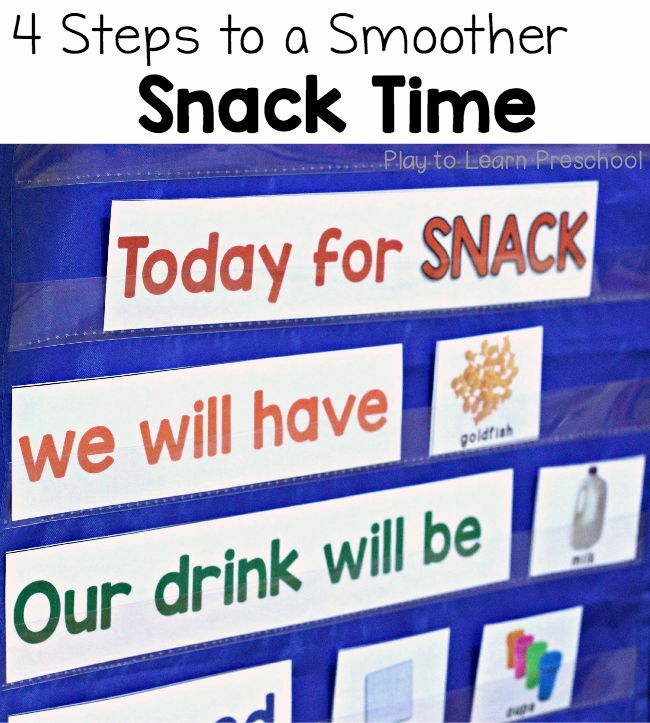 They love being “big kids”, and we find that our snack time runs much smoother with these 4 things in place. 1. 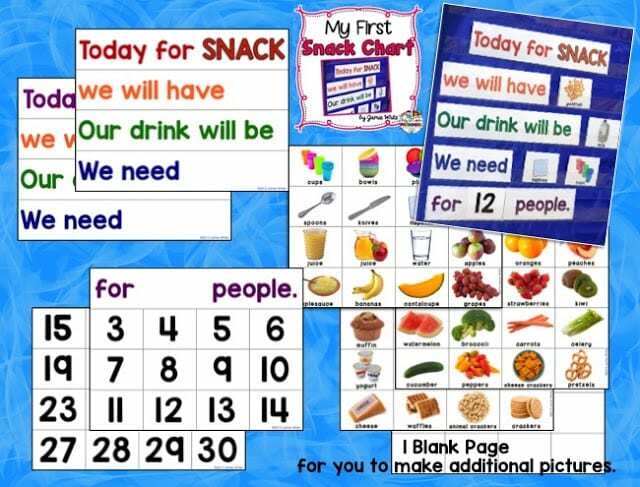 Make a snack chart or poster. Before this was hanging in our room, I answered the question of, “What’s for snack?” a dozen times every day. 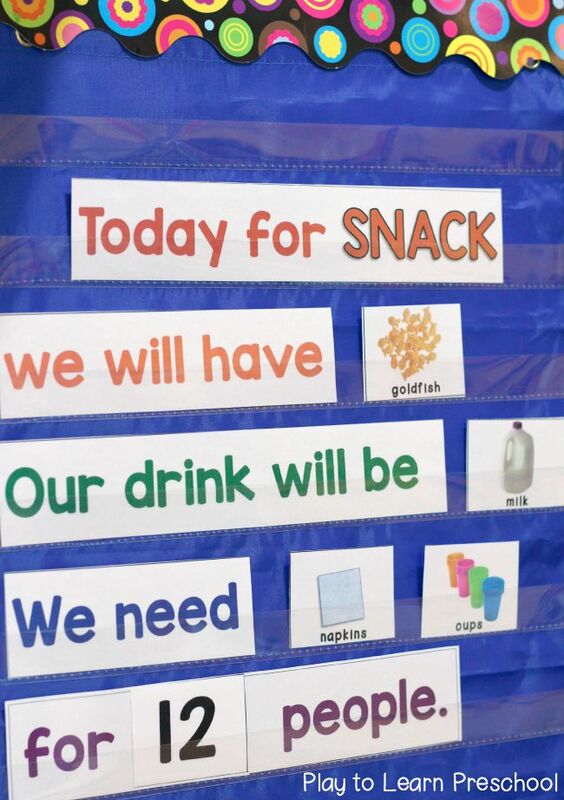 Now we include reading our snack time chart as part of our morning routine. It’s great for practicing Concept of Word! 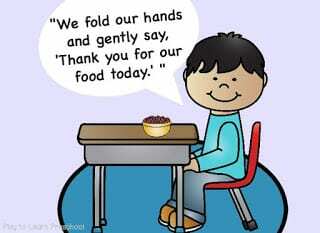 Then the students can refer to it any time they wonder what’s for snack. 2. Set them up to be INDEPENDENT. If we want our preschoolers to be independent, we have to make sure that they tools they need are within reach. 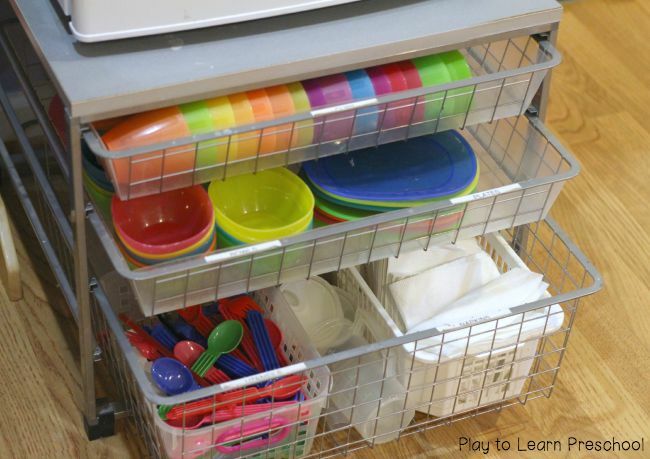 These drawers are in our snack area hold all of the cups, bowls, plates, napkins and utensils that the snack helpers need to set the tables. When it’s their turn, the helpers count out 10 of each and place them on the table. Math at snack time! 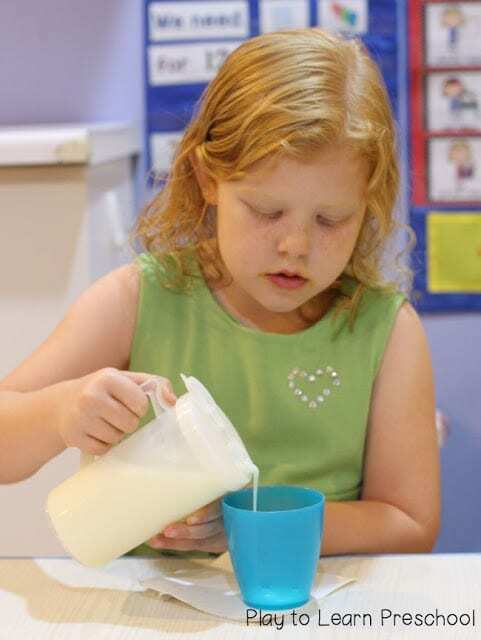 We also teach our students to pour their own drinks. I got these little “Pint Pitchers” at Walmart in the kitchen aisle, next to the measuring cups. I think they were $1 each. Amazon doesn’t seem to sell them, so no link, but I see them at Walmart all the time. 3. Establish a simple routine for BEFORE and AFTER they eat. 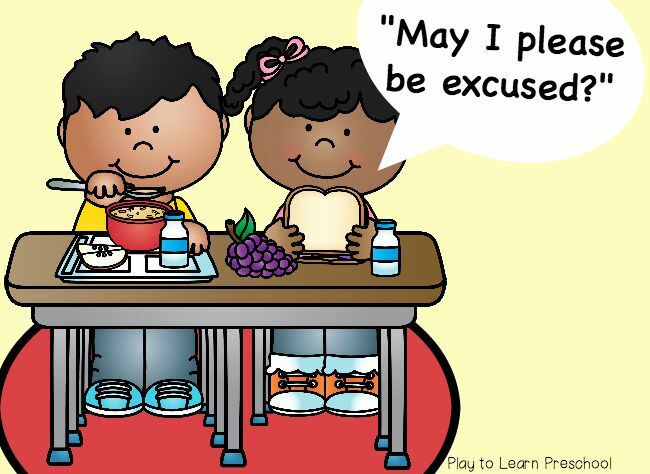 When they are finished, they ask to be excused. They put their cups in the dirty dish bucket and their napkins in the trash, and return to centers. Adorable clipart from Whimsy Clips. 4. 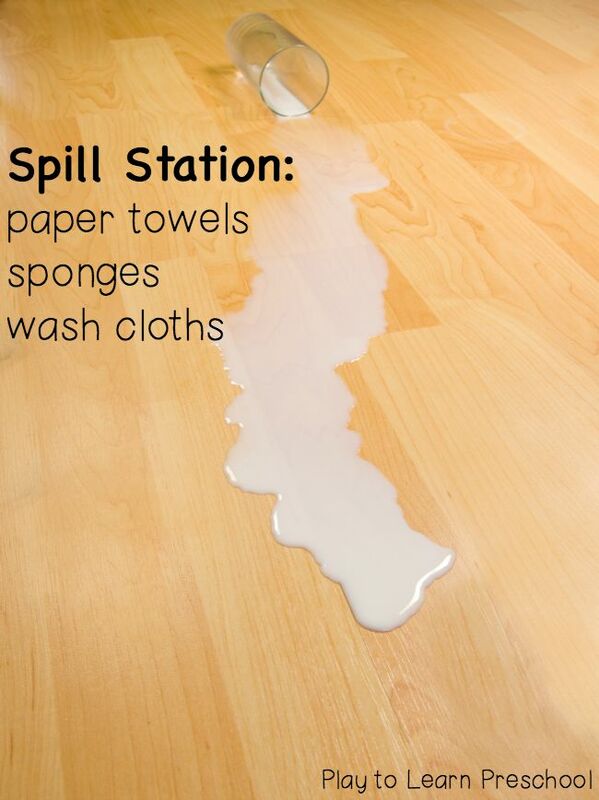 Make sure you have a SPILL STATION. 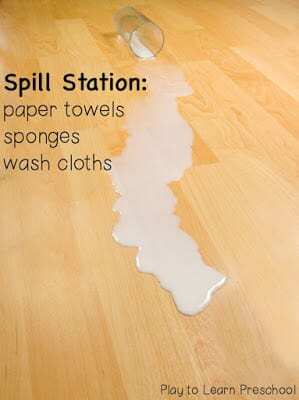 We have to teach our preschoolers what to do when there is a spill, because most of them just sit there and stare blankly at us, waiting for someone to come to their rescue! So, we teach them where to get the supplies, how to wipe it up, and where to put the wet towels. Then they go back to the drawers and get a new dry napkin for themselves and start again! 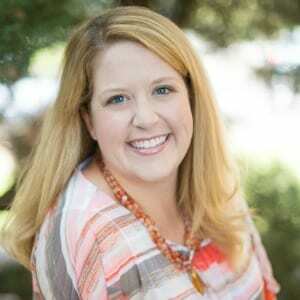 These 4 steps work really well for us, and I’d love to hear about routines that help your students and help you maintain your sanity with preschoolers! Previous Post: « Should Children Write their Names with Capital Letters? Hi Lisa! The cart is from the Container Store (elfa). The pitchers are from Walmart, in the kitchen aisle near the measuring cups. And I will take a picture of the spill station when school starts and it is all stocked up! Thanks for reading the blog! Who is responsible for washing your dishes at the end of the day? We use disposable everything, and it’s a huge amount of waste. But we don’t have a kitchen staff, so I’d likely have to send one of my assistants to wash all the dishes for 19 children each day.